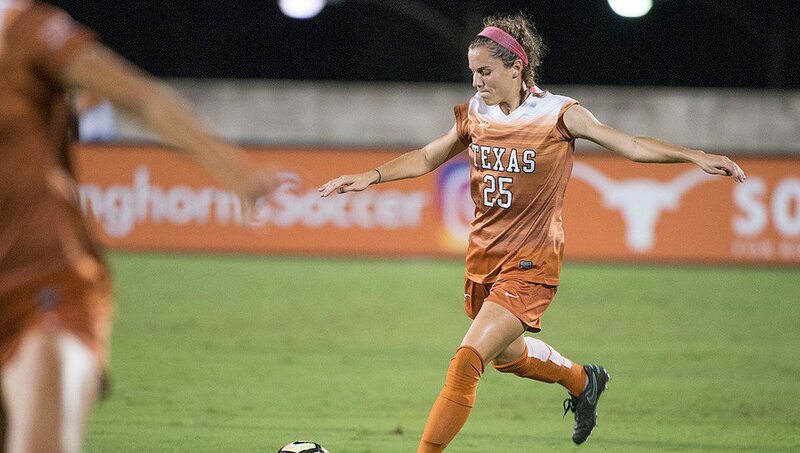 Sophomore Katie Glenn's third goal of the season helped the University of Texas soccer tie Baylor in the conference opener for each team (photo courtesy of texassports.com). WACO, Texas — Sophomore midfielder Katie Glenn scored her third goal of the season to help the University of Texas soccer team tie Baylor, 1-1, in double overtime in the first Big 12 game of the season for each team. Glenn controlled a Baylor turnover and buried a shot from the top of the penalty box in the 47th minute to give the Longhorns a 1-0 lead in the 47th minute. Caitlin Schwartz got the equalizer for the Bears in the 53rd minute. With the victory, the Longhorns’ record now stands at 6-3-1 overall and 0-0-1 in Big 12 games. Baylor is 7-3-1 overall, and 0-0-1 in Big 12 games. UT’s unbeaten streak is now four games. "We're pleased tonight because we did some good things," Texas head coach Angela Kelly said. "It really comes down to more productivity in the final third, but what a battle. (Baylor's) is a tough style to play against. Lots of contact throughout the course of the match, but we did a lot of good things, and we'll be ready to go on Sunday." The Longhorns play the Oklahoma Sooners at 1 p.m. Sunday in Norman, Okla., in a game that can be seen on Fox Sports Oklahoma, Fox College Sports Central and Fox Sports Go. The Bears outshot the Longhorns, 14-8, although UT had a 5-4 edge in shots on goal. Baylor held an 8-7 advantage on corner kicks.